Hello and welcome to another episode of the Cookbook Love Podcast. 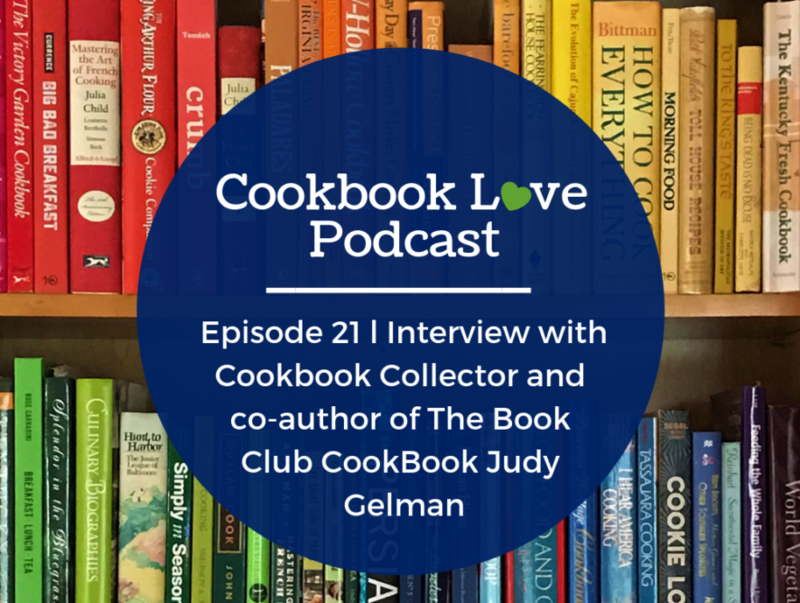 Today on the podcast, I’m featuring an interview Cookbook Collector and author of The Book Club CookBook Judy Gelman. This is a unique episode for the podcast in that I haven’t to this date interviewed a traditionally published cookbook author. The goal of the podcast is to talk to and share stories with cookbook readers, buyers, collectors, and clubs, and so far for the first 20 episodes, I’ve done just that. But the book I feature today intrigued me, so I reached out to coauthors of the BookClub Cookbook Judy Gelman and Vicki Levy Krupp about an interview. The Book Club CookBook explores the connection between books and food in own book clubs. Judy and Vicky, we were both intrigued by the idea of pairing books and food, and they found that food and cooking is often a fun and interesting part of book club meetings. In this interview, Judy and I discuss her tips of starting a book club, finding an agent for a cookbook project, and her mid-century cookbook collection, inspired by her work on The Unofficial Mad Men Cookbook.